Like you, most homeowners don’t think about waste water removal services – until you REALLY need them! And when you do need waste water services, who can you trust to turn up on time, do the job, and not charge ridiculous rates? If you call outside of our office hours, just leave your details on the answerphone, and we’ll get right back to you the next working day. 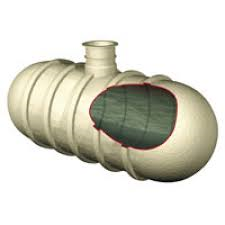 If your rural property is not on mains drainage, chances are you have a brick built cesspit or fibreglass septic tank. This will need emptying on a regular basis to ensure it works properly and doesn’t block, spill or damage your sewage system. Call us and we’ll come and empty it with the minimum of fuss or disruption. Having your cesspit emptied on a regular basis will ensure you household waste system works well, and you won’t have any backup into your home drainage systems. Easy Clean Services has been emptying domestic cesspools since 1994, so we know precisely what we are doing! Homeowners like you rely on our schedules, friendly, and efficient service to empty and maintaining a cesspool, and help to prevent any potential problems. Call us today and we’ll empty your cesspit efficiently and effectively. A cesspool is a sealed, watertight tank that sits underground to collect waste water and sewage. They require frequent emptying due to not having any drainage facility; Cesspools are an ideal solution where septic tanks cannot be installed due to wet or poor drainage. However, due to the higher costs involved in emptying cesspools, these should be considered as the last option for a sewage system. Cesspools may be located in difficult to access places, and so not every wet waste disposal company can help you when you need them most. Our vehicles are adapted for narrow lanes and entrances to make sure that we can attend any cesspool. We also have a tractor tanker for cesspools in more remote locations, or when bad weather prevents our normal road tankers access your road. Never fear, we will not leave you in a desperate situation! If you and your neighbours share a small sewage treatment plant, we congratulate you! You’re helping the environment with one of the most efficient and cost effective methods of waste management. If you keep it well maintained and have a de-sludge to remove accumulated solids every 6-12 months, your plant will give you years of trouble-free operation. At ECS, we install and maintain all types of small sewage plant systems, so we know exactly how they work, what the issues may be, and how to solve them quickly. Call us for both regular and one-off small sewage plants de-sludge, and ongoing maintenance. Sewage treatment plants work in a similar way to a septic tank, with the addition of mechanical components to break down solids and produce a more environmentally friendly effluent. 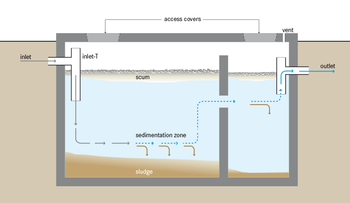 Wastewater and sewage are fed into the primary settlement tank where the liquid and solids separate. The liquid then flows into a biozone chamber with a pump, which agitates the waste and produces good bacteria. The effluent then flows through a final chamber known as the humus chamber. This can produce effluent 95% cleaner than traditional methods, and can discharge into local watercourses (with the consent of your local Environment Agency). There is a large variety of different sewage treatment systems designed for very different applications and installations. Easy Clean Services are happy to offer advice on the best system for your home. Call us or see our Package Sewage Treatment Plants Installation page for details. Water seeping in where it shouldn’t be? Don’t hesitate! Call us for prompt service in clearing waste water caused by flooding, blocked drains, or faulty sewerage systems.